Eastern Regional Championships, USA - On Friday Robbie Farnham-Rose unfortunately had to pull up with a calf injury towards the end of his 1500m heat. Robbie is due back in England in the middle of June so, hopefully, will be on the mend by then. Putbos Flanders Cup, Belgium - On Saturday night Ryan Driscoll ran a superb 8.10.77 for 3000 metres, to take 10 seconds from his personal best. Ryan's time is the fastest by any TAC member for many years (certainly more than ten). 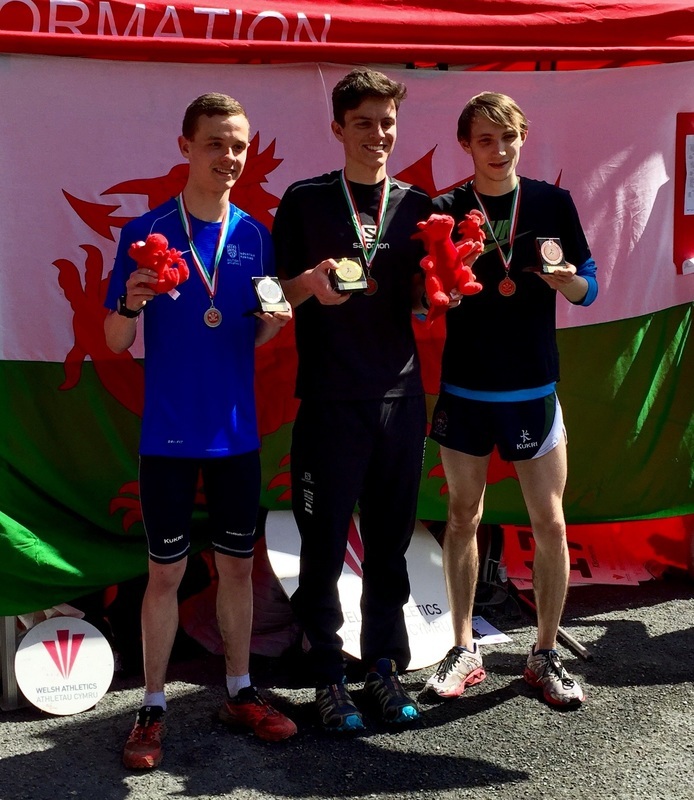 Great Britain Mountain Running Trial in the Lake District - Max Nicholls won the under 20 race to secure his place in the GB team to travel to Madeira for the European Championships in July. 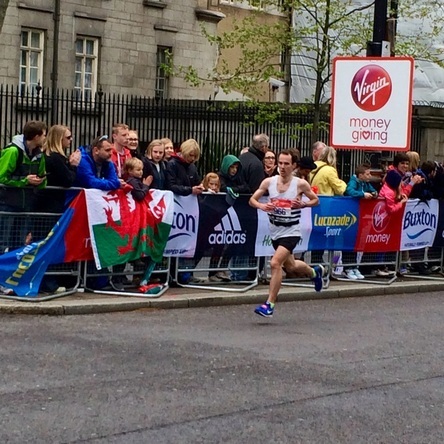 Bristol 10k road race - Ben Cole finished 17th in this high class road race in 31.19 on Sunday. Nicola Wilkinson ran 39.17. Tonbridge finished second to hosts Crawley, in generally damp conditions, but held off the tough challenge of Milton Keynes and Colchester. Hannah Czarnowski put in one of her terrific team efforts to score in the 800m, 400m, 1500m steeplechase and the 4x400m relay ! There were outright wins for Sean Molloy (400m), Alice Ralph (800m and 1500m steeplechase), Tom Cox (800m), Marcin Urbanowski (3000m) and Harry Paton (3000m steeplechase). Marcin was making his TAC debut and running his first track race since 2010. He has just joined the club and started training again after five years away from the sport. At his peak he represented Poland at the World Cross Country Championships and also ran 8.42 for 3000m steeplechase. For Harry Paton the win was his second ever in any race and was his debut at the 3000m 'chase. Despite a long round trip for all eight of the Tonbridge runners, there were some excellent performances. Sean Molloy was disappointed with a 1.51.67 for 800m. Despite it being a personal best, it is still more than three seconds away from his pb, so he still has a bit of work to do. In the mens 1500 metres A race James West reduced his pb to 3.46.59, but will still be hoping to get closer to the GB qualifying time for the European under 20 championships. This stands at 3.44.5. George Duggan is another with thoughts of the Euro under 20 standard in the back of his mind and he too nudged closer with a pb of 3.47.77, despite being involved in a messy race. Dom Brown tweaked a calf muscle and jogged home in 3.52.5, a couple of seconds outside his best. In race D TAC had three competitors, who all finished close together and improved their bests. A resurgent Luca Russo ran 3.52.03 to dip ahead of Chris Olley's 3.52.06, whilst Miles Weatherseed improved the long standing Judd School record with 3.52.62. The final TAC runner, Alex Howard, went in race F of the 1500m and even shocked himself with a win and a five second pb of 3.54.78. A summary of our results is on the Results 2015 page. Team positions and scores are awaited. The next match is on Saturday 21st June and Nigel Brooks, the team manager, needs some more middle distance runners, as we had a few gaps on the team sheet this time around. Photos below courtesy of Gary Goodge. James Taylor (JT) is a relatively new convert to the parkruns and is stringing together a sequence of Saturday morning runs, at a variety of locations. This week he ran at Tunbridge Wells and was first home in 16.59, which is a course personal best for him. Blackhill - Tony (21.33) and Andrew (22.50) Bennett ran. They are the sons of our President Alan Bennett. There were a dozen TAC distance runners in action at Eltham, with seven coming away with personal bests and four others running season's bests. Christian Lee was the most improved at 800m, as he lowered his best to 2.01.20. However, it was Steve Tester, moving up from 400m, who was the fastest of the club's 800m runners with 2.00.15. At 1500m Phoebe Barker ran inside the English Schools Inter Girls qualifying standard for the first time, although she will have to repeat this at one of the recognised selection events. At 5000m, Corey De'Ath smashed his 5000m pb by 33 seconds to 15.04.19, whilst Dan Watt took 10 seconds from his with 16.03.68. Sean Molloy, George Duggan and Luca Russo did some excellent pacemaking work, covering all the races for the British Milers Club. Ben Cole led the TAC squad home with another sub 31 minutes clocking, as he finished 32nd in 30.56. Eva Kolivoskova-Martin was the first of the ladies in 42.59. Eva took yet another 2.39 from her pb and has taken 7 or 8 minutes off since starting training with TAC in late November. Summary results are on the Results 2015 page. Full results from both days are now on the Results 2015 page. I have produced a summary of the TAC distance runners runners performances at the county championships (see Results 2015 page). What struck me was the number of personal bests and some from athletes who weren't happy with their performance. There are a number who can be very tough on themselves, which can be a good thing, but on occasions its healthier to take the positives and move on to the next race, rather than beat yourself up, especially when you run a pb ! Tonbridge AC had two individual winners at the Westminster Road Miles as Kathleen Faes won the under 15 girls and Fin Croll the under 11 boys. In the under 15 boys race we had 6th Christian Lee, 10th Tom Dean and 19th Bede Pitcairn-Knowles. Aimee Holdstock was 17th in the under 11s. For others see results on the Results 2015 page. 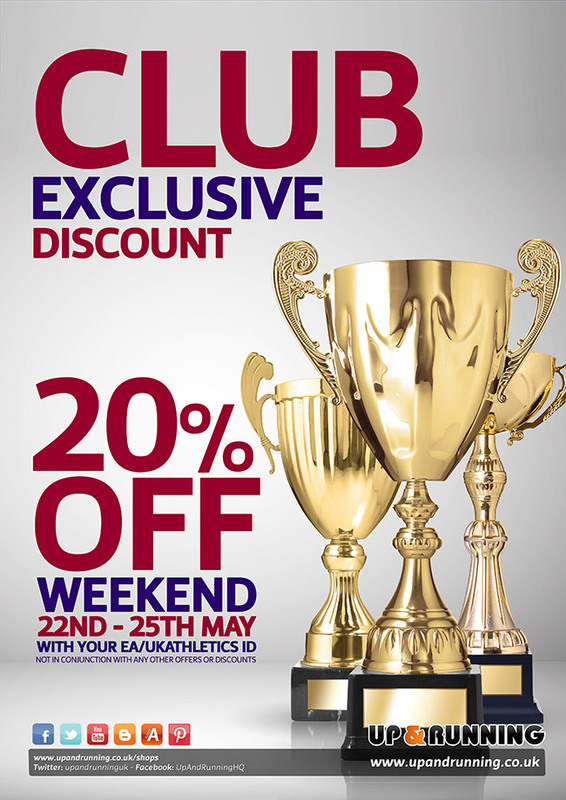 Alan Pope at Up and Running, Sevenoaks is offering a 20% discount this coming weekend on Friday and Saturday. Up and Running, 150 High Street, Sevenoaks, Kent TN1 1XE. You will need your England Athletics ID. See below. There were three 1500m personal bests from George Duggan (3.49.53), Dom Brown (3.49.91) and Ryan Driscoll (3.50.07), plus an incredible 5000m debut from Chris Olley in 14.18.41, which is inside the European under 20s qualifying standard of 14.20. The conditions were cold and quite breezy, for much of the evening, so the performances from the four Tonbridge runners were excellent. Chris is not guaranteed a place in the GB team for the European Championships, as this only happens if he wins the trial in June. The selectors can take upto three runners, who have the time and currently two have. Tonbridge finished 2nd in the match of the six clubs and are equal top of the division after two matches. Alice Ralph was a double A-string winner, including an impressive 1500m steeplechase in 5.28.06. Similarly, Corey De'Ath won the under 20 men's 3000m and 1500m. Becky O'Hara, Christian Lee, Jamie Goodge and Michael Ellis also scored A-string wins. The biggest personal best came from Sam Avis in the 3000 metres to 10.07.84, an improvement of 32.7 seconds, whilst sam Crick was also in impressive form, with two big pbs at 1500m and the 2k steeplechase. Full results are on the Results 2015 page. Photos below courtesy of Sam Crick and friends. Full results are on the Results 2015 page. All photos below courtesy of Mark Pitcairn-Knowles. 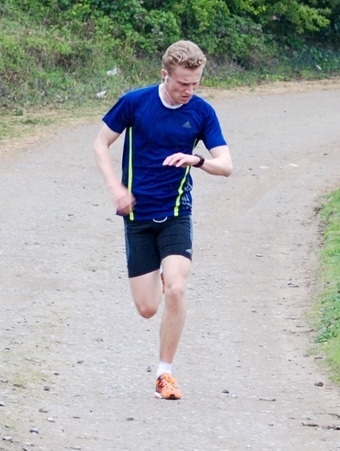 Max Nicholls finished 12th overall and first under 23 at the UK Inter Counties Fell Running Championships. Robbie Farnham-Rose ran 3.47.45 to qualify for the 1500 metres final at the SEC Championships. Robbie was sixth in his heat and made it as a fastest loser qualifier. He reports that he scrambled passed a few, having been boxed in with 20 metres to go. Unfortunately Robbie did not finish the final, having been spiked and losing a shoe within 100 metres of the start. He got as far as 1100 metres, before he dropped out. The results featuring TAC athletes are on the Results 2015 page. Tonbridge AC had six distance runners in action at Brighton, on what was an ideal evening, being still, sunny and reasonably warm. All six had encouraging races, with four personal bests, one season's best and one just a fraction of a second away from their best this year. Kathleen Faes had her first run over 1500 metres this season and ran 4.33.58, which improved her pb by more than two seconds. It also put her top of the UK rankings by more than ten seconds ! Kathleen will hopefully have Julie Adkin's (Goodge) club under 15 record of 4.32.2 within her grasp soon. The next success story came from Sian Driscoll who improved her 800m best to 2.14.31, taking 2.5 seconds from her previous time. Of more significance, for Sian, who is at school in Sussex, is that it's inside the English Schools qualifying time for the distance. Sian's time is also the fastest by a TAC female athlete for six years. Continuing the 100% pb success rate for the girls on the night was Melissa Berry, who ran 1500 metres in 5.10.43, a 6.4s improvement and a total gain of more than sixteen seconds from her pre-2015 best. The only male TAC pb on the night came from the consistently improving Michael Ellis, who ran 6.30.26 in the 2000 metres steeplechase, taking 4.2s from his best. Tom Cox ran a solid 1500 metres in 3.57.75 to finish second in the A race and Tom Dean just missed his season's best over 800m with 2.03.94. 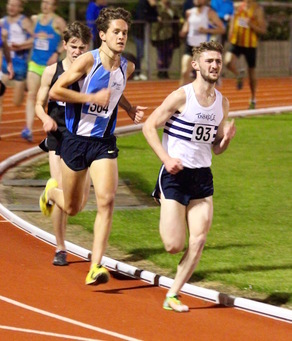 James West ran his opening 1500m of the season in 3.55 to win the race at Loughborough. James went through 800m in 2.11, before the race sped up. A 56 second final lap saw James come home ahead of team mate Frank Baddick. He now goes on to race 1500m at the Loughborough International meeting, on Sunday. There were 800m wins for Tilly Hall (u15) and Katie Burgess (u13), plus a host of pbs and debuts. I am sure that the team managers could do with more under 13s and 15s for the next fixture as there are still gaps in the team sheets that could be filled. Dan Watt showed that he has recovered from the London Marathon and moving towards better form once again, when he finished third in the Hastings 5 mile road race in 27.38. There were quite a few TAC distance runners in action at Tonbridge School today, in their school colours, as Tonbridge hosted Judd, Sevenoaks, Harrow, Guildford and Brighton (I think !). Race videos now loaded ! On a day when gales blew and there was heavy rain, I think many decided to stay away from racing tonight, as there were 'only' twelve 1500m races and a couple of 3000s. It was, therefore, good to see twelve TAC distance runners get out there and give it a go, looking for some early season form. As things turned out the weather, at the time of racing, could have been a lot worse, since the wind died down a fair bit and when it did rain, it was only light for a short period. However, it was cold for early May ! The conditions didn't prevent seven of our runners coming away with personal bests, aswell as George Duggan winning the fastest 1500m race of the night, in impressive style, with 3.52.00. Miles Weatherseed took a chunk from his pb, in the same race, with 3.54.61. The evening began for TAC in race 7 of the 1500m, where Bede Pitcairn-Knowles shaved four hundredths of a second from his best with 4.33.79 and was followed in the next race by Sam Avis (4.35.24), with a 5 second pb. Then in the remaining 1500m races there were bests for Jamie Goodge (4.08.02) and Christian Lee (4.16.41). Chloe Bird went in the first of the 3000m races and ran 5.08/9 for the first half, which was effectively a 1500 pb, having not raced one before ! Chloe then had to tough it out for the second half and recorded an eighteen second pb with 10.51.29. In the final race of the night, Chris Olley used his frustration from falling in the BUCS 1500m semi final at the weekend, to finish 3rd in the 'A' race here with a big pb of 8.19.94. Chris became the third TAC runner this year to dip under 8.20, after Robbie Farnham-Rose and Kieran Reilly achieved it in the USA indoor season. Summary of TAC on the Results 2015 page. 5000 metres - 15th Max Nicholls 15.54.22 in a very slow and tactical race. Day 3 results (Results 2015 page) and videos loaded. TAC enjoyed plenty of success at these local road races. In the 2.5 mile race Ellie Cohen was 1st Female (2nd overall), with Elizabeth Heslop 3rd female. John Harley was 1st over 60 in the 10 miles and Sally Musson 1st female over 60 in the 10 miles. Results now posted on the Results 2015 page. We had a bit of a disappointing day on day 2 of the championships, although Dom Brown got through the mens 1500 metres semi finals to make Monday's final. Luca Russo was eliminated from the 1500m, as was Chris Olley, who tripped and fell. Earlier in the day James West went out at the semi final stage of the 800m. Day 2 results (Results 2015 page) and videos loaded. Robbie Farnham-Rose finished 8th in the 800m in 1.50.50. This was Robbie's second fastest ever 800m and he reports the first lap was so fast at 52 ! 1500m - Luca Russo, Dominic Brown and Chris Olley all placed in the first four of their heats to gain automatic qualification to the semi finals. 3000m steeplechase - Ryan Driscoll won his heat in 9.30 (approx), a personal best and with Alex Howard qualified for Monday's final. Michael Ellis (3000m steeplechase) and Jack Keywood (5000m) were eliminated in the heats. Day 1 results (Results 2015 page) and videos loaded. Tonbridge placed 4th of the six clubs in the premier division. Three of the four TAC individual wins came at 800m through Kathleen Faes (u15), Fin Croll (u13) and Katie Burgess (u13). For Katie this was a personal triumph as she has suffered with knee problems for much of the last year, which she has overcome so well. Evie Butler also deserves a mention for improving her 1500m pb to 4.58.1, an improvement of 16s. Many thanks go to Gary Goodge, who has supplied the video footage of the races, which is now loaded. The standout run today by a TAC athlete at a parkrun came from Corey De'Ath who ran 15.32 at Dartford to take 30s from the course record. Dan Bradley was also inside the old record with 15.58. Mark Pitcairn-Knowles has announced plans for the Summer 2015 Tonbridge AC parkrun Grand Prix. Details of qualifying runs and the format are in the file below. Andrew Mercer holds the trophy as winner in the Winter and Dan Bradley won last Summer. The first qualifying event is this Saturday 2nd May. Mark has also included a couple of other venues ie Tunbridge Wells and Lullngstone in the list of events for this series. This Sunday is the London Marathon and mini marathons and a few from TAC are competing. The Tonbridge AC team put in a great effort today to win the first match of the Southern Athletics League. Having only been promoted last season to this top division, we came away with a cracking win with 219.5 points, to Blackheath 188, Basingstoke 165.5 and Stevenage 150. The distance runners contributed significantly with wins, personal bests and even one athlete well inside the league record and not even winning. 2000m men's steeplechase - Ryan Driscoll ran 5.49.24, which was eight seconds inside the league record, but was pipped on the line ! The weather was good and there were some international athletes on show including Dina Asha-Smith (World Junior 10m champion and European Indoor silver medalist at 60m). I am unsure which was the most encouraging of all the TAC distance runners' performances - Alice Ralph's win double ? Sean Molloy's 'comeback', including a 49.4 relay spilt ? Alice Wood's pb over 1500m after 5 years ? or Ryan Driscoll being well inside the league steeplechase record ? Or maybe it was the great team effort by Lucy Pitcairn-Knowles and Emma Avis, who scored 2 points each in the 3000 metres, showing great TAC team spirit ! Tunbridge Wells - 1st James Taylor 17.08 + congratulations to Joe Watts, of TAC, who is the event organiser and has helped the parkrun through to its first anniversary. George Duggan displaying all the hallmarks of a jogger - earphones, T-shirt and looking at his watch before the finish ! 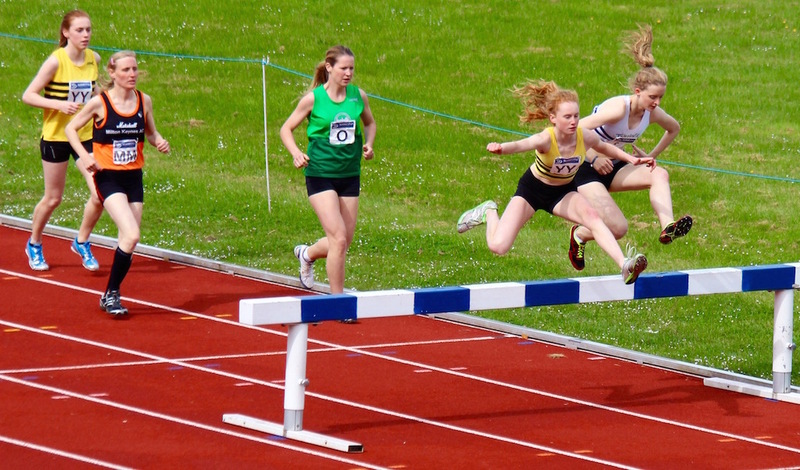 Watford once again delivered good weather and competition for their evening open meeting. Once the early evening breeze dropped and the faster races commenced, the athletes enjoyed almost perfect conditions, despite being a little cool. With nineteen races over 800m and 120 entries for the 3000m, it was once again a late finish, but worth the trip. There were eight TAC athletes in action, with Sian Driscoll off first in race nine of the 800m. Sian ran 2.16.86 to take 1.5 seconds from her personal best. Sam Avis then produced the most dynamic performance of his life, as he hit the front of his 800m with about 250 to go and won in a five second pb of 2.08.50. Corey De'Ath was just 0.04s away from another TAC pb when he ran 1.58.61, whilst Luca Russo improved his best by 1.3s to 1.53.97. Then in the last 800m race George Duggan recorded 1.52.97 (just 0.4s outside his best) and Dom Brown sliced 1.3 seconds from his pb with 1.53.46. The 3000 metre races finished off the night, with Sam Crick and Bede Pitcairn-Knowles going in race 2. They had set themselves pre race targets of 9.20 and 9.35, respectively, but both ran superbly to beat these. Sam ran 9.06.19 (debut) and Bede 9.30.38 (24s pb). Then in the final race Ryan Driscoll ran 8.28.00 and Luca Russo (30 mins after his 800m) 8.47.97. The performances were very encouraging for so early in the season and I am sure all of them will move on again, in the coming weeks.